The Boxtrolls is a 2014 American stop-motion animated fantasy comedy film. Produced by Laika, it was directed by Graham Annable and Anthony Stacchi with a screenplay by Irena Brignull and Adam Pava, based on the novel Here Be Monsters! by Alan Snow. 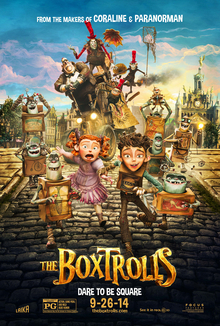 The film tells the story of Eggs, a human boy raised by trash-collecting trolls, known as "Boxtrolls", as he attempts to save them from Archibald Snatcher, a pest exterminator. The film introduces Isaac Hempstead-Wright as the voice of Eggs and features the voices of Ben Kingsley, Elle Fanning, Dee Bradley Baker, Steve Blum, Toni Collette, Jared Harris, Nick Frost, Richard Ayoade, Tracy Morgan, and Simon Pegg. The film was released on September 26, 2014, by Focus Features, to generally positive reviews from critics. The film earned $109 million on a $60 million budget. It was nominated for an Academy Award for Best Animated Feature. In the fictional hill-top town of Cheesebridge, Norvenia during the Victorian era, rumors abound that subterranean trolls (known as Boxtrolls for the cardboard boxes they wear) have kidnapped and killed a young child. Pest exterminator Archibald Snatcher strikes a deal with the city's leader Lord Portley-Rind to exterminate every Boxtroll in exchange for membership in the city's cheese-loving council called the White Hats, despite the fact that he is severely allergic to cheese. Snatcher hatches an evil plan and teams up with his three loyal advisors Mr. Trout, Mr. Pickles, and Mr. Gristle to kill the White Hats, exterminate the Boxtrolls, rule Cheesebridge, and rename it "Snatcher-ville". In actuality, the Boxtrolls are peaceful and emerge from underground at night to scavenge for discarded items with which to make useful inventions. A human boy named Eggs lives among them, cared for by a Boxtroll named Fish. As Eggs grows up, he becomes dismayed by the disappearing Boxtrolls seized by Snatcher. After Lord Portley-Rind's daughter Winnie sees Eggs with two Boxtrolls, Snatcher captures Fish. Eggs sneaks to the surface to find Fish and emerges in an annual fair to commemorate the disappearance of the "Trubshaw Baby" who was allegedly killed by Boxtrolls. Disgusted by the town's inaccurate portrayal of the creatures, Eggs follows Winnie. After a brief exchange, he asks her for directions to Snatcher's headquarters, located at an abandoned factory, where Eggs rescues Fish. They are caught in the escape. Snatcher recognizes Eggs as the Trubshaw Baby and reveals that all the captured Boxtrolls are building him a machine. Winnie, who covertly followed Eggs, overhears this exchange. She then helps Eggs and Fish escape from Snatcher and they take shelter in the Boxtrolls' caves, where Fish explains that Eggs' father had given him to them to keep him from Snatcher. Winnie agrees to help Eggs tell Portley-Rind the truth. At a ball held to commemorate the purchase of a giant cheese wheel called the Briehemoth, which was foolishly made using the funds for a children's hospital, Eggs tries to confront Portley-Rind, but is confronted by Snatcher (disguised as a woman named "Madame Frou-Frou" who is his imaginary wife). Whilst trying to avoid Snatcher, Eggs inadvertently knocks the cheese wheel into a river. Eggs announces himself to the party as the Trubshaw Baby, but no one believes him including Portley-Rind who is too upset about losing the cheese wheel. Eggs tries to persuade the remaining Boxtrolls to flee for their own safety, but Snatcher digs into the caves and captures them all. Eggs awakens to find his father Herbert Trubshaw a prisoner beside him. He sees the Boxtrolls stacked in a crusher and begs them to leave their boxes and run, but they are apparently killed by the crusher. Snatcher drives his machine to Lord Portley-Rind's house, shows him the flattened boxes as proof of the Boxtrolls' extinction, and demands Portley-Rind's white hat in exchange for killing the last Boxtroll, which is actually Eggs disguised. The Boxtrolls, who have escaped from the crusher, and Herbert free Eggs, while Snatcher tries to take Portley-Rind's hat by force. During the fight, Mr. Trout and Mr. Pickles redeem themselves, join Eggs' team and help the group disable the machine which falls on Mr. Gristle. Eggs and Snatcher are thrown clear and land on the recovered Briehemoth, which triggers Snatcher's cheese allergy and causes him to swell to an enormous size. He seizes Winnie and forces Lord Portley-Rind to give up his hat in exchange for her safety, but he explodes into pieces after tasting an aged cheese sample. The townspeople and Boxtrolls begin a peaceful coexistence. Winnie tells the tale of Snatcher's end to a crowd, while Eggs and Fish drive off in one of Herbert's contraptions. In a mid-credits scene, Mr. Trout and Mr. Pickles clean the streets and have a philosophical discussion as a Laika Studios employee animates the scene, breaking the fourth wall. Isaac Hempstead Wright as Eggs, an orphaned human boy raised by the Boxtrolls. Ben Kingsley as Archibald Snatcher, a ruthless, antagonistic and cunning pest exterminator who also cross-dresses as Madame Frou-Frou. Elle Fanning as Winnie Portley-Rind, Eggs's first human friend and the daughter of Lord and Lady Portley-Rind. Dee Bradley Baker as Fish, Wheels, and Bucket, three Boxtrolls. Steve Blum as Shoe and Sparky, two Boxtrolls. Toni Collette as Lady Cynthia Portley-Rind, Winnie's mother and Lord Portley-Rind's wife. Jared Harris as Lord Charles Portley-Rind, Winnie's father, the cheese-obsessed leader of the White Hats, and the leader of Cheesebridge. Nick Frost as Mr. Trout, Snatcher's corpulent, bumbling, yet intellectual bodyguard. Richard Ayoade as Mr. Pickles, Snatcher's tall, spindly, well-meaning but misguided bodyguard. Tracy Morgan as Mr. Gristle, Snatcher's diminutive and maniacal second-in-command and best friend. Simon Pegg as Herbert Trubshaw, a brilliant inventor and Eggs's father. Nika Futterman as Oil Can and Knickers, two Boxtrolls. Pat Fraley as Fragile and Sweets, two Boxtrolls. Fred Tatasciore as Clocks and Specs, two Boxtrolls. Directors Anthony Stacchi and Graham Annable promoting the film at the 2014 San Diego Comic-Con International. In June 2008, Laika unveiled a slate of projects in development, among which was also an animated feature film adaptation of the Alan Snow novel Here Be Monsters!, eventually to become The Boxtrolls. The animation technique wasn't yet decided upon, but Anthony Stacchi was set to direct the film. Laika announced on February 7, 2013, that the adaptation would be their next 3D stop motion feature, under the title The Boxtrolls. Directed by Stacchi and Graham Annable, Laika CEO Travis Knight noted that the biggest challenge of the film was to condense a 550-page novel down to a 90-minute film. Initially the film focused on all five species of creatures found in the original book, but Knight noted that the script "ultimately was hollow" with all the monsters noting "It didn't really have anything to say." The team ended up focusing on the Boxtrolls as Knight thought "there was something that was really compelling about that group of characters". On February 7, 2013, Focus Features originally set the film for an October 17, 2014, release, In May 2013, the release date was changed to September 26, 2014. Focus Features holds worldwide distribution rights to The Boxtrolls, and Universal Pictures International released the movie overseas (with eOne Distribution handling Canada). On June 11, 2014, two new trailers, one for the US and one for the UK, were released by the studio. The film premiered at the Venice Film Festival on August 31, 2014. The Boxtrolls was released on DVD and Blu-ray on January 20, 2015, by Universal Pictures Home Entertainment. On December 4, 2013, composer Dario Marianelli was hired to score The Boxtrolls, the first animated feature film of his career. On August 30, 2014, it was announced that Back Lot Music would release a soundtrack album for the film on September 23, 2014. All music composed by Dario Marianelli, except as noted. The Boxtrolls grossed $50.8 million in North America and $57.4 million in other territories, for a worldwide total of $108.2 million, against a budget of $60 million. In the United States and Canada, it earned $17.2 million in its opening weekend from 3,464 theaters, debuting at number three at the box office behind The Equalizer and The Maze Runner. It had a strong 3.5x weekend multiplier off its $4.9 million opening day, which is more front-loaded than Coraline (3.8x) but played much less front-loaded than ParaNorman (3.11x). It set the record for the biggest opening weekend for Laika surpassing 2009's Coraline ($16.8 million), and the second-biggest for a stop-motion animation film behind Laika's 2005 co-production, Corpse Bride ($19.1 million). In other territories, The Boxtrolls earned $5.1 million from 1,806 screens in 16 countries in its opening weekend. In terms of total earnings, its largest markets are the United Kingdom and Ireland ($13.8 million), Australia ($5.8 million), and Mexico ($5 million). It is Laika's highest-grossing film overseas, surpassing ParaNorman's $51.1 million. On review aggregator Rotten Tomatoes, the film holds an approval rating 76% based on 161 critics, with an average rating of 7.1/10. The site's critical consensus states: "While it's far from Laika's best offering, The Boxtrolls is still packed with enough offbeat wit and visual splendor to offer a healthy dose of all-ages entertainment." On Metacritic, the film has a weighted average score of 61 out of 100, based on 37 critics, indicating "generally favorable reviews". Audiences polled by CinemaScore gave the film an average grade of "B+" on an A+ to F scale, while PostTrak reported filmgoers gave it a 77% overall positive score and a 61% "definite recommend". Tom Huddleston of Time Out gave the film three out of five stars, saying "Breathlessly paced and surreally funny, The Boxtrolls fizzes with visual invention and wild slapstick. But the grotesquerie is overbearing." Alonso Duralde of The Wrap gave the film a negative review, saying "A surprisingly charmless and aimless movie from Laika Studios, who previously crafted the wonderfully dark Coraline and ParaNorman, this latest venture seems destined to disturb young viewers while thoroughly boring their parents." Amy Nicholson of LA Weekly gave the film a B+, saying "The Boxtrolls is a kiddie charmer that makes you laugh, cower and think of Hitler. That's an unusual trifecta, but then again, this is an unusual film." James Rocchi of Film.com gave the film a 5.8 out of 10, saying "The Boxtrolls is a swing-and-miss for Laika; when you move forward with revolutionary techniques while standing still in terms of your themes, stories and settings, no amount of technical trickery or animation genius can bring the boring to vivid life." Jake Coyle of the Associated Press gave the film a positive review, saying "The Boxtrolls, despite a rather uncertainly structured story by screenwriters Irena Brignull and Adam Pava, has its pleasantly demented charms." Kyle Smith of the New York Post gave the film two out of four stars, saying "Engaging as it is to look at, this stop-motion animation film from the young Oregon studio Laika seems to have been masterminded by people thinking, "Everyone loves Pixar. So let's do everything the opposite!"" A. A. Dowd of The A.V. Club gave the film a B+, saying "In an age when most cartoon companies have traded pens for pixels, the magicians at Laika continue to create fantastically elaborate universes out of pure elbow grease." John Hartl of The Seattle Times gave the film three out of four stars, saying "Visually the film is a feast, stuffed with little jokes and surprises and the kind of black humor that Alfred Hitchcock heartily enjoyed." Brian Truitt of USA Today gave the film three out of four stars, saying "A delectable treat that balances themes of identity and class warfare with Monty Python-style political skewering, quirky humor and dairy jokes." Mick LaSalle of the San Francisco Chronicle gave the film two out of four stars, saying "One gets the sense that directors Anthony Stacchi and Graham Annable have their hearts in the action sequences and not in the characters, and that's a problem." Michael Phillips of the Chicago Tribune gave the film two out of four stars, saying "The Boxtrolls remains relentlessly busy up through its final credits, and it's clever in a nattering way. But it's virtually charmless." Michael O'Sullivan of The Washington Post gave the film three out of four stars, saying "The story of The Boxtrolls, in lesser hands, might have turned out only so-so. Under Laika's loving, labor-intensive touch, it takes on a kind of magic." Richard Corliss of Time gave the film a positive review, saying "The Boxtrolls has its penny-dreadful moments, but it's mostly a larkish stroll through a cemetery where the monsters are the good guys." Ethan Gilsdorf of The Boston Globe gave the film a positive review, saying "Like one of its wondrously designed steampunky contraptions, The Boxtrolls is a marvelous thing to behold, and watch spin, even if it doesn't go anywhere terribly interesting." Bruce Demara of the Toronto Star gave the film three and a half stars out of four, saying "From Laika, the animation studio that brought you such memorably quirky classics as Coraline and ParaNorman comes another totally offbeat and original tale for kids (and adults) looking for something a little more challenging and completely off the wall." Rafer Guzman of Newsday gave the film two-and-a-half stars out of four, saying "The Boxtrolls has moments of humor and imagination, but American children may not be its ideal audience." A. O. Scott of The New York Times gave the film a positive review, saying "In The Boxtrolls, old-fashioned stop-motion animation is combined with new-style 3-D cinematography to charming effect." David Rooney of The Hollywood Reporter gave the film a mixed review, saying "There's a crucial shortage of heart here, from the messy storytelling to the hit-or-miss humor and unattractive visuals." Steve Persall of the Tampa Bay Times gave the film a D, saying "The Boxtrolls is a visually repellent pile of stop-motion animation, populated by grotesques and filmed in the palette of an exhumed casket's interior. It can frighten small children and bore anyone, with its cracked, cackled British wit." Joe Neumaier of the New York Daily News gave the film two out of five stars, saying "Kids who get a kick out of the macabre will enjoy this exquisitely crafted but tedious film." ^ a b "Dario Marianelli to Score 'The Boxtrolls'". Film Music Reporter. December 4, 2013. Retrieved February 12, 2014. ^ "THE BOXTROLLS [2D] (PG)". British Board of Film Classification. August 12, 2014. Retrieved August 13, 2014. ^ "'The Equalizer' Gunning for Nearly $40 Million at Weekend Box Office". Variety. 27 September 2014. Retrieved 27 September 2014. ^ a b c "The Boxtrolls (2014) - Box Office Mojo". Box Office Mojo. Internet Movie Database. Retrieved November 28, 2015. ^ a b c d e f g h i j k l m "LAIKA Announces Third Animated Feature, The Boxtrolls". ComingSoon.net. February 7, 2013. Retrieved July 2, 2013. ^ a b Chitwood, Adam (July 2, 2013). "First Teaser Trailer and Poster for THE BOXTROLLS, from the Makers of CORALINE and PARANORMAN". Collider.com. Retrieved July 2, 2013. ^ a b Netburn, Deborah (February 7, 2013). "'The Boxtrolls' is the next film from 'ParaNorman' animators". Hero Complex. Los Angeles Times. ^ a b c d e f g h i j "The Boxtrolls (2014) - Cast and Crew - AllMovie". AllMovie. Retrieved November 13, 2014. ^ a b Liu, Ed (September 25, 2014). "Toonzone Interviews Dee Bradley Baker & Steve Blum on How to Speak Boxtroll". Toonzone. ^ "DT Interviews "Boxtrolls" Voice and Sound Artist, Dee Baker". Digital-Tutors Blog. Retrieved October 7, 2014. ^ a b c d Durade, Alonso (August 30, 2014). "'Boxtrolls' Venice Review: A Charmless Misfire from Laika Studios". The Wrap. ^ S. Cohen, David; Debruge, Peter (June 23, 2008). "Laika unveils development slate". Variety. Retrieved February 7, 2013. ^ a b c "Laika CEO Travis Knight talks The Boxtrolls and the Future of Stop-Motion Animation". Den of Geek. Retrieved 24 March 2016. ^ Anderton, Ethan (11 June 2014). "Laika's Animated 'Boxtrolls' Gets Two New Trailers for the US & UK". firstshowing.net. Retrieved 12 June 2014. ^ "Laika's 'Boxtrolls' to Screen at Venice Film Festival". Awn.com. 2014-07-24. Retrieved 2014-07-28. ^ "The Boxtrolls Blu-ray". Blu-ray.com. November 8, 2014. Retrieved November 8, 2014. ^ "'The Boxtrolls' Soundtrack Details". filmmusicreporter.com. August 30, 2014. Retrieved August 31, 2014. ^ Harti, John (September 25, 2014). "'The BoxTrolls': Out comes humor, surprises, great visuals". The Seattle Times. Retrieved October 17, 2014. ^ a b Scott Mendelson (September 24, 2016). "Box Office: Denzel Washington's 'The Equalizer' Opens To $35M Weekend". Forbes. Retrieved March 28, 2016. ^ Pamela McClintock (September 28, 2014). "Box Office: Denzel Washington's 'The Equalizer' Scores $35 Million Debut". The Hollywood Reporter. Retrieved September 28, 2014. ^ Ray Subers (September 28, 2014). "Weekend Report: 'The Equalizer' Scores Fourth-Highest September Debut Ever". Box Office Mojo. Retrieved September 29, 2014. ^ Nancy Tartagloine (September 28, 2014). "Int'l Box Office Update: 'The Equalizer' Clocks $17.8M In Debut; 'Maze Runner' Races To $91M Cume; More". Deadline.com. Retrieved September 29, 2014. ^ Brent Lang (September 28, 2014). "'The Maze Runner' Tops Foreign Box Office for Second Week". Variety. Retrieved September 29, 2014. ^ Pamela McClintock (September 29, 2014). "International Box Office: 'Maze Runner' Beats 'Equalizer'; 'Lucy' Nears $400M Globally". The Hollywood Reporter. Retrieved September 29, 2014. ^ "The Boxtrolls (2014) – International Box Office". Box Office Mojo. Retrieved March 28, 2016. ^ Brent Lang. "'Boxtrolls' passes $100 million, becomes Laika's biggest international hit". Retrieved November 13, 2014. ^ "The Boxtrolls". Rotten Tomatoes. Fandango Media. Retrieved January 21, 2015. ^ "The Boxtrolls Reviews". Metacritic. CBS Interactive. Retrieved December 28, 2014. ^ "War Dogs' Begins Barking On Thursday Night – Box Office". Deadline Hollywood. Retrieved August 22, 2016. ^ "The BoxTrolls". Time Out London. Retrieved September 26, 2014. ^ "'Boxtrolls' Venice Review: A Charmless Misfire from Laika Studios - TheWrap". TheWrap. Retrieved 26 September 2014. ^ "The Boxtrolls". LA Weekly. 4 September 2014. Retrieved 26 September 2014. ^ "Review: 'The Boxtrolls'". Film.com. Retrieved 26 September 2014. ^ "Review: 'Boxtrolls' Has a Demented Charm". ABC News. Retrieved 26 September 2014. ^ Smith, Kyle (24 September 2014). "Animated film 'The Boxtrolls' has a twee Victorian vibe". New York Post. Retrieved 26 September 2014. ^ "Review: The makers of Coraline return with another morbid marvel, The Boxtrolls · Movie Review · The A.V. Club". Retrieved 26 September 2014. ^ "'The BoxTrolls': Out comes humor, surprises, great visuals". The Seattle Times. Retrieved 26 September 2014. ^ Brian Truitt, USA TODAY (25 September 2014). "'The Boxtrolls' opens up a quirky world of fun". USA Today. Retrieved 26 September 2014. ^ LaSalle, Mick (25 September 2014). "'The Boxtrolls' review: Technically glorious but boxed-in fantasy". SFGate. Retrieved 26 September 2014. ^ "Boxtrolls review - Chicago Tribune". chicagotribune.com. 25 September 2014. Retrieved 26 September 2014. ^ Ou2019sullivan, Michael (September 25, 2014). "'The Boxtrolls' movie review: Intricate stop-motion animation carries a sweet story". Washington Post. Retrieved 26 September 2014. ^ Corliss, Richard (September 24, 2014). "The Boxtrolls Movie Review: Laika Follows Up Coraline With New Pic". TIME.com. Retrieved 26 September 2014. ^ "Movie review: Stylistically, at least, 'Boxtrolls' thinks outside the box - Movies - The Boston Globe". BostonGlobe.com. Retrieved 26 September 2014. ^ "Boxtrolls thinks outside the traditional animated box: review". thestar.com. Toronto. Retrieved 26 September 2014. ^ "'The Boxtrolls' review: More Monty Python than Walt Disney". Newsday. Retrieved 26 September 2014. ^ Scott, A. O. (September 25, 2014). "'The Boxtrolls' Is an Adaptation of 'Here Be Monsters!'". The New York Times. Retrieved 26 September 2014. ^ Rooney, David (30 August 2014). "'The Boxtrolls': Venice Review". The Hollywood Reporter. Retrieved 26 September 2014. ^ "Review: 'The Boxtrolls' is one boring monstrosity (w/trailer)". Tampa Bay Times. Retrieved 26 September 2014. ^ "'The Boxtrolls,' movie review". NY Daily News. New York. September 25, 2014. Retrieved 26 September 2014. ^ "2014 SAN FRANCISCO FILM CRITICS AWARDS:Full List of Nominees". San Francisco Film Critics Circle. 2014. Retrieved December 14, 2014. ^ Patches, Matt (January 1, 2015). "'Boxtrolls,' 'How to Train Your Dragon 2' lead Annie Awards Nominations". Hitfix. Retrieved January 4, 2015. ^ "42nd Annual Annie Award Nominees". Retrieved December 1, 2014. ^ "2015 GOLDEN GLOBE NOMINATIONS". Golden Globe Awards. Archived from the original on December 12, 2014. Retrieved December 12, 2014. ^ "13th Annual VES Awards". visual effects society. Retrieved January 3, 2018. Wikimedia Commons has media related to The Boxtrolls panel at the 2014 Comic-Con International.